The Town Centre is being re-developed to improve how the town functions as a destination, work involves creating entrance gateways, celebrating the very best local materials and supporting shops with grants of up to 75% to improve their shop fronts. Blaenau Ymlaen was formed as a voluntary group to bring various regeneration groups and plans together. It meets every two months and there’s a warm welcome to everyone. Blaenau Ymlaen, Cyngor Gwynedd and the Welsh Government were successful in obtaining European ERDF funds for regenerating town centres, the money can not be used for anything else. We have a significant amount of empty shops. The area’s population is reducing 2.5% every year with a lot of people moving away to work. 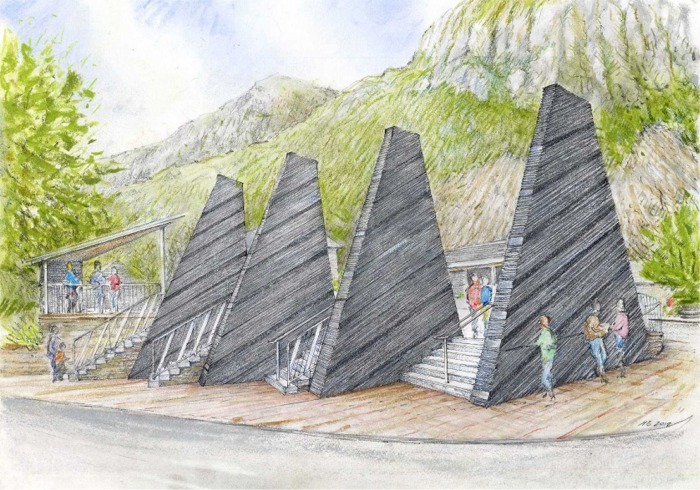 The project links into the Antur Stiniog scheme to develop outdoor activities in the area. We also need to make the most of the visitors who arrive in Blaenau but return to Porthmadog without visiting the town. Click Here to downlaod more information about Blaenau Ymlaen. Click Here to visit Gwynedd Council's Blaenau Ymlaen web page.